Where the board wants to improve its overall performance. Our experienced boardroom consultants provide coaching for established boards - coaching the whole board together. 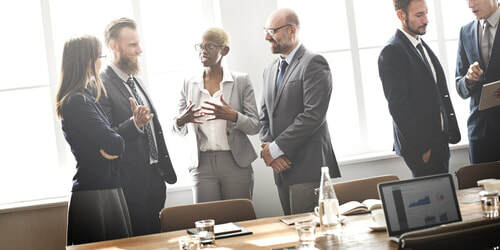 We are often asked to intervene in this way when the board is facing an emotionally charged situation, when the Board has become stuck in a particular pattern of conversation such as group think, when relationships within the board have broken down or where factions have developed within the Board. We use a dialogic approach based on observing a series of meetings using our innovative Board Watch process. The price per session, including observation, is £550.00 plus VAT. Where ongoing conflict exists between two board members as a consequence of different behavioural styles. The relationship between the Chair and Chief Executive is pivotal to the success of the Board and influences the Board’s ability to set the tone for, and provide value to the organization. We also provide coaching for the Chair and Chief Executive together to help build an effective relationship that strikes a balance between independence of thinking and support. We use the Kantor Institute’s Behavioural Propensities Profiling Instrument, as the basis of much of our coaching. It helps raise awareness of self and others by exploring the client’s default behaviours when interacting with another person or a group.